 【SAFE & QUICK GRINDING】: Especially thick diamond grindstone cut head adopted, durable, can quickly and safely trim pet nails, ensures safe cutting for your loved pets.  【ULTRA-QUIET & LONG BATTERY LIFE】: DC3.7V mute motor adopted with less than 50 dB, pets dear to use; high-quality brass shaft with running speed of 6800 RPM, super power and long service life. USB portable charging with over-charge protection, supports quick charge of 1 hour, full charge ensures 240 minutes using.  【2 ROTARY SPEEDS】: 6,000 RPM for trimming pet nails accurately, 6800 RPM for quickly grinding pet nails. The rotation speed can be appropriately selected according to the hardness of pet nails. 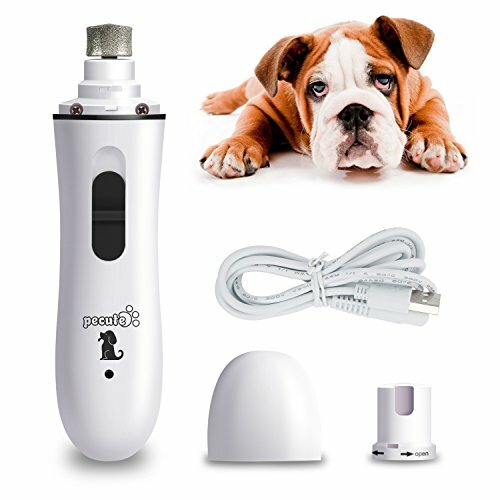  【WIDELY APPLICABLE】: Pecute pet nail trimmer with security cover, you can choose a suitable grinder mouth according to the pet size; Suitable for large, medium and small pets.  【1 YEAR GUARANTY】: Providing our customers with high quality products is always our promise. If you have any questions with us, Pecute will provide one year guaranty for our customers from the date of purchase. Very quiet and works great!! Pecute come sempre il migliore.